Website with Rackspace Cloud Files really costs in Cents – you can create a sales Website, your Photography Website, Profile Website at absolutely cheaper cost yet you are using a Platform on OpenStack Cloud Computing Software, which is geographically server (so very fast) and the backend is Akamai’s bare metal. Essentially, this type of guide for creating a website with Rackspace Cloud Files is nothing new – we are writing, showing various advanced usages since many years – but, previously we needed to change some settings, which apparently was difficult for a new user; now Rackspace offers more easy to create with only using their web graphical interface. 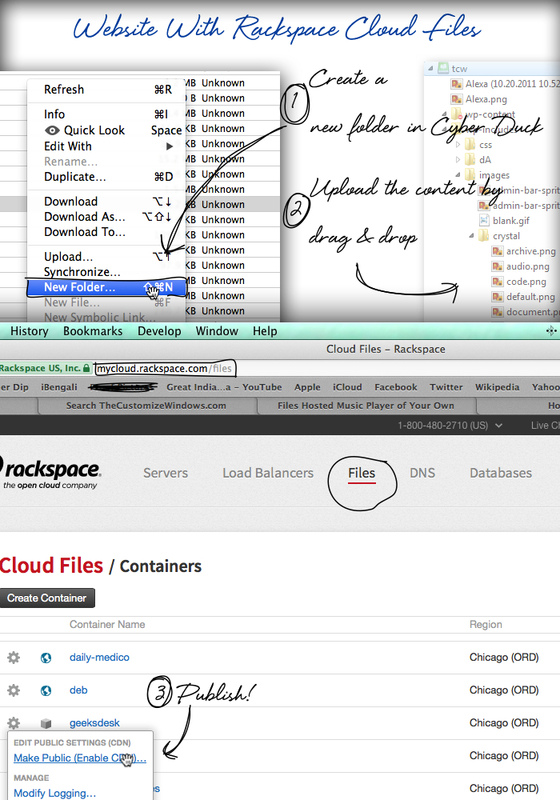 So, this guide to build a website with Rackspace Cloud Files is basically an update. This part is more important than you can think! Yes, you basically one need not to know the old method – although it is important for other usages (read Serving Fonts from Rackspace Cloud Files CDN), but the list of articles and guides will give you a fair idea about what you can do with Rackspace Cloud Files. As a paid option, honestly Rackspace Cloud Files costs next to nothing (for our other websites we tested all existing CDNs including direct Akamai’s service. Direct Akamai can be great and known to be the best CDN but cost is quite higher for medium usage). Practically, performing a search on this website with Rackspace Cloud Files will give you a good search result like a list. May be, there can be something interesting for you. First, download Twitter Bootstrap or the HTML+CSS+JS template/framework from Github or other official website. Edit the Template in any Text Editor, we use Coda on Mac for this purpose. HTML files normally shows as on browser “preview” on localhost (=your computer). LAMP setup is not required. Download Cyber Duck and configure it for Cloud Files – read this article for step by step guide. However, your Container is not Public. You will see the unpublished container’s icon is different – its like a cube at the time of writing. Click it to get the option to publish the container. Done. Copy the SSL or Non-SSL URL and point your browser. Example is here. It is relatively complex example. Other examples are in other guides. This Article Has Been Shared 3555 Times! Open Source Hardware provides hardware specifications like Open Source Software, which are publicly available,you can buy the smallest parts and build yourself. Open Source Free Health can make a Glucose Meter of few dollars, a Robotic Surgical unit of few hundred dollars. Overall burden of health is made by the brands. Cloud Computing and Service Oriented Architecture (SOA) are two complementary concepts that can be used independently or in agreement. PaaS or Platform as a Service has a great opportunity to transform application development. PaaS is intended for application deployment, still website can run. Cloud Based Mobile App for Keyless Entry or Build Something More with Selfstarter which is distributed by Lockitron as Free repo. Here is how to get started. Cite this article as: Abhishek Ghosh, "Website With Rackspace Cloud Files : Hosting That Costs Cents," in The Customize Windows, December 21, 2013, April 18, 2019, https://thecustomizewindows.com/2013/12/website-with-rackspace-cloud-files/.